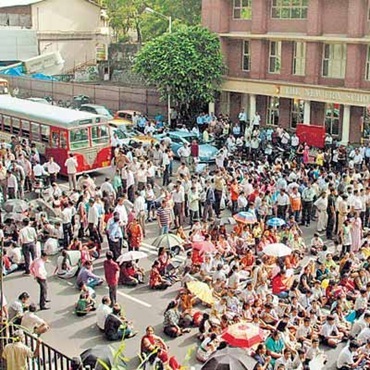 Parents and students of New Era School on Pedder Road took out a â€œrasta-roko andolanâ€ outside the school to protest the school closing an unsafe building. Traffic along the six lane Pedder Road was disrupted for over 8 hours (+/-). Pedder Road in the city is one of the busiest thoroughfares. Not only for local traffic but also for suburban commuters connecting to points in South Bombay. 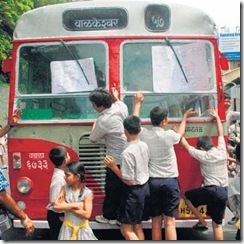 This protest was nothing but a tamasha that the parents and kids resorted to so that they get some media coverage. Ironically this happened on the same day that Omar Abdullah resigned. So the hoped for TV coverage didnt happen as they wouldve loved. What pisses me off is the reasons and the modus operandi of these very selfish parents. The school wants to demolish the building because it is unsafe for occupancy. They are moving the children to another building a little distance away. The building has been inspected by three independent structural engineers who all agree that is is unsafe. However the parents still want the school to keep the building open and let their children study in this unsafe building. The parents allege that the school is trying to shunt out the lower fee-paying SSC division to some other building and use this plot to build a fancy high fee-paying Intâ€™l division school. The controversy started last year when the school management decided to permanently shift SSC students to a new location on D N Road in Fort, as they wanted to demolish the existing building at Hughes Road for IGCSE and IB Board. Parents approached the HC against decision and won the case in July. If this is correct and I am sure there is some truth to it, then take this to court, get a stay order and pursue it through legal means. Donâ€™t resort to uncivilized hooligan tactics. The police stood there for the most part and could not do much as they said kids were involved and therefore they could not use any means to disperse the crowd. I guess they meant tear gas et al. The parents took shelter behind the children and held the city and lakhs of people to ransom. 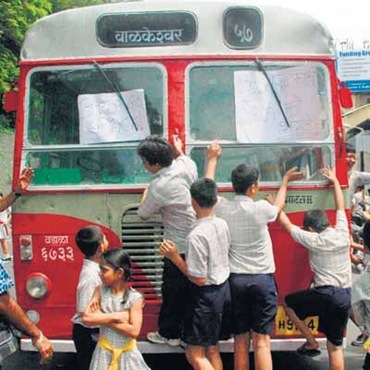 What is more appalling is that students were encouraged to do crazy things like climb up on the front of buses etc as this picture shows. This also sends a very wrong message to children, the adults of tomorrow. It teaches them that taking the law into your own hands is the recourse to all problems and loutish, roughish behavior is the way to go. Mahafreed Irani, a journalist with Times of India and a friend from the blog/twitter/facebook world has a first person account on her blog. Here the intent (on part of the school management) was safety of the children and staff. And it is justifiable considering the age of the building. Canâ€™t see any reason how anyone on earth could ignore safety!! !